Yoda, Jedi Grand Master once told that, “Once you start down the dark path, forever will it dominate your destiny” and so can be said about the latest special edition Star Wars Special Edition Notebook from HP. I am sure you are never going to leave it out of your sight as well as your heart will be filled with proud to have something like this Star Wars Notebook machine which will enable you to control the whole universe with your fingers. The great looks of the machine matters to those who love things much beyond they love themselves and their lives. HP Star Wars notebook will inspire your dark side to take over the creative aspect with full force and you can create whatever you want as the processing powers of this machine is the best that’s available in the milky way galaxy. It has sixth generation Intel core i5 processor which can handle multitasking as commanded by the emperor of the machine. The black and red themed notebook will bring your blood to boil whenever you see something which doesn’t have as much power for the price you pay for it. 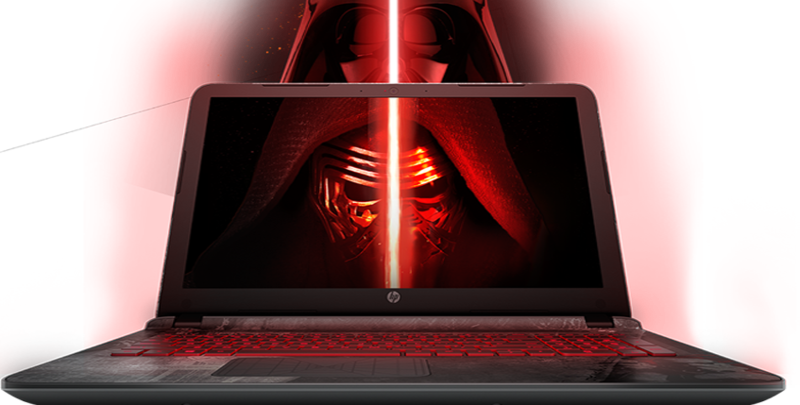 With HP Star Wars Notebook, there is something you can always do to keep your adrenalin running in your blood vessels. I am very much hopeful that I create something unique always, be it managing my DSLR raw images using Adobe Photoshop and Lightroom or creating Visio diagrams for my professional assignments. Be it developing a new Android/iOS app or Microsoft app this is capable to handle all the data you can think of. My fun way to use this machine is to watch the first six parts on DVD/Blu-Ray versions end to end to initiate myself into the world of creativity to bring the galaxy far far away closer to home. 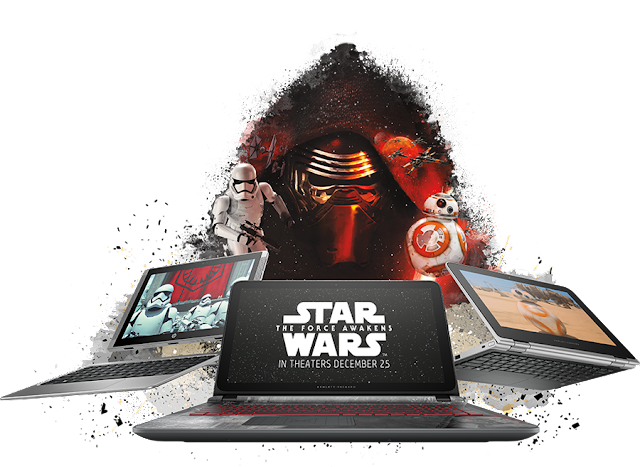 Then to celebrate the success of buying myself this Notebook, I need to go and watch 3D of the latest version of movie The Force Awakens. In the end, I want to read all the Wikipedia pages about the movies and characters along with fun facts search on google to complete the journey. This is I consuming all the matter created by my ancestors and my evoking my hidden powers to learn and think about what to do next? When this notebook starts on its B&O play speakers then even clouds lose their thunder as the sound is so deep that it brings our your worst fears alive. For me the party starts anywhere I have this machine and some people around. No need to buy something else for the parties anymore. As the dark forces always believes in revenge so it is the memory capacity of 1TB on this notebook to keep all your content on the machine in reach and 8GB of RAM to faster process it also. 2GB graphics card makes me look ever darker in space with lot of detail on the display which is worthy of my eyes. All of this is wrapped in the special software created to carry me towards my destination even when the times are light and walking is tough. I can get inspiration from other worlds as themes can be configured and downloaded. I am so living in the fun that now neither friends nor enemies matters to me as I belong to the HP Universe and they belong to me. My dark side has become the saberlight for the world to carry in their hands till the end of time. In the end, I am sure of the fact that “For over a thousand generations, the Jedi were the guardians of peace and justice in the Old Republic — before the dark times. Before the Empire.” But now it is my time and I am making the most of it day and night with HP Star Wars Special Edition Notebook.